rain buddy Joe Murray. He is also a member of this forum and has been very helpful in guiding my recent layout overhaul. We are township neighbors here in Florida. 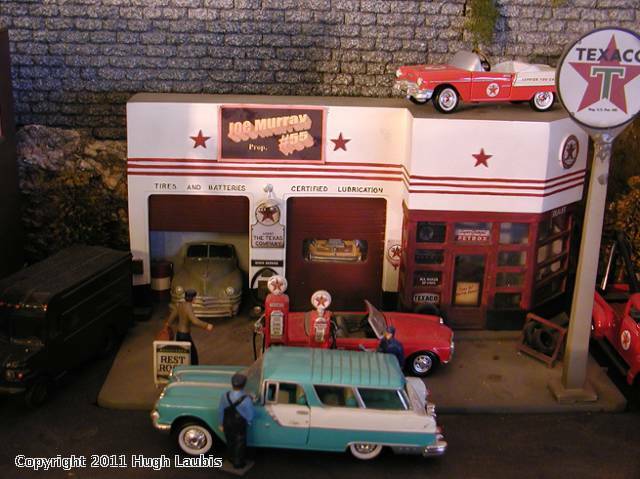 The real Joe Murray Garage was in East Stroudsburg, PA which Joe owned and ran for 21 years. The designation of #55 on the owners sign makes reference to his car number as a stock car racer. Racing of all types still is Joe's true passion, although personally long time retired from active participation. He has been involved in dirt track modified stock racing most of his adult life. He started racing in 1956 in 1937 ford coupes and sedans which you could buy for a couple of hundred bucks with a good 85 hp flathead motor. His automotive expertise came from building cars with big block fuel injected alcohol burning 800 hp 467 cu. in. motors. He raced and won many trophies all over the northeast circuit. Some notable tracks were Bone stadium, Pittson, PA, Stroudsburg Speedway, Nazareth 1/2 mile speedway, Harmony speedway, NJ, Blue mountain Speedway, Wind Gap, PA Allentown fairgrounds, PA, Five mile point speedway, Binghampton, NY, and many others. After Joe stopped personally driving in races, he became a car owner, kept in buildings, and as an owner won 37 features in a six year period at the Moc-a-Tek speedway in Lakeville, PA.
Joe wishes he had kept at least a few of those 1937-1940 Ford coupes he cut up to race. The 55 Chevy on the roof of Joe Murray's Garage typifies his dedication to the #55 race history. I am proud to have his symbolic garage on my layout.